In the early morning of August 7, 1974; French high-wire artist Philippe Petit did the impossible. He and his accomplices snuck into the unfinished World Trade Center. Then strung a wire between the twin towers. New Yorkers awoke to the astonishing spectacle of Petit doing a tightrope walk across the 140 foot distance. Philippe Petit walked for forty-five glorious minutes without a safety harness. Garnering worldwide acclaim and accolades for his tour de force achievement. That story gets retold in the new drama The Walk. Director Robert Zemeckis came across Petit's story in a children's book, The Man Who Walked Between the Towers by Mordecai Gerstein. Zemeckis was totally unaware of Petit's walk. He was not only intrigued by the sheer bravado of Petit, but also his ingenious plan to fix the wire between the buildings. The 9/11 attack and the destruction of the Twin Towers is seared into our collective memories. Zemeckis felt that the beauty of the towers, their immense grandeur, deserved to be honored. Joseph Gordon-Levitt stars as Philippe Petit in The Walk. The actor vanishes utterly into the role of the intrepid Frenchman. In our interview below, Gordon-Levitt discusses his desire to play a French character and his time spent with Petit. He also talks at length about what he learned from Robert Zemeckis, the incredible realism of the visual effects, and what he wants audiences to take away from this film. James Badge Dale and Ben Schwartz are also on hand to offer their insight into the making of the movie. The highlight of the press event was a vertigo inducing virtual reality demonstration of the actual walk. I've done a few VR simulations, but this was absolutely next level. You're literally on the wire, up 1,400 feet, hearing the wind rush past you. This was beyond cool. I look goofy as hell in the VR helmet, but believe me, it was an ultra-realistic experience. The Walk is a magnificent tribute to the Twin Towers. It is told in a storybook, dream-like way. Invoking a sense of wonder and adventure for a place that holds such sadness in our hearts. 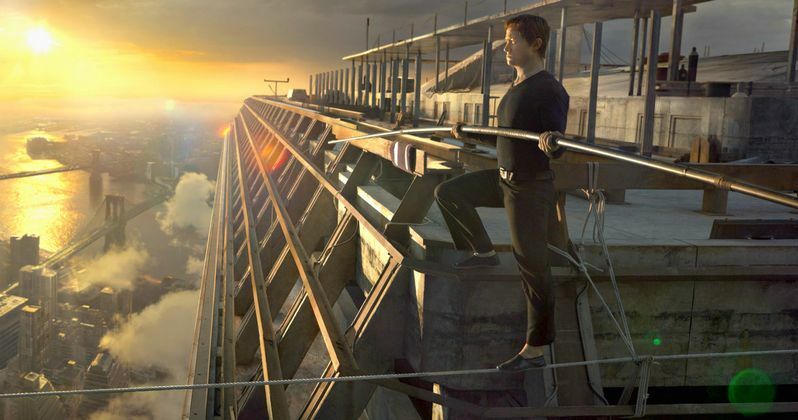 The Walk is a must see in IMAX 3D. The story of Philip Petit is also brilliantly told in the Oscar winning documentary, Man on Wire.